Belfast Harbour has invested £3m in the world’s largest hydraulic crane to enhance its cargo handling capacity. The 370 tonne crane can manage individual lifts of up to 50 tonnes. Manufactured in Finland, the ‘Mantsinen 300M’ offers additional flexibility and capacity for Belfast Harbour which handles over 23m tonnes of cargo annually. At almost 40m high, the crane will be the largest crane of its kind operating in any British or Irish port, and can unload and load multiple types of cargo. It is designed to discharge up to 1,000 tonnes of bulk cargo such as grain or animal feed per hour. “In the past 10 years Belfast Harbour has invested £30M in new cranes to enhance the efficiency and productivity of our quayside operations. “Belfast Harbour should be commended for investing in the latest handling technology. 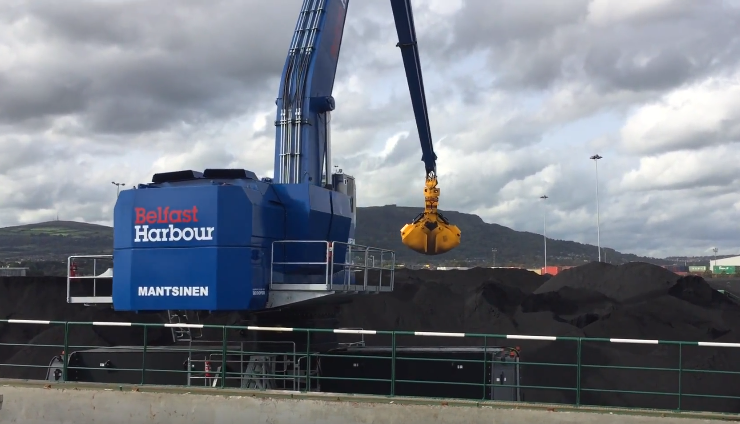 In the past, rope-styled cranes were the only option for handling bulk cargoes and larger vessels, but that has changed thanks to the new generation of hydraulic cranes now available.